Most Colleges Have Given Up on Real Education. Middlebury is Just One Example. Free speech is dead at many if not most American colleges. Its open-coffin wake took place when administrators at America’s largest Catholic university, DePaul in Chicago, refused to let mainstream conservative Ben Shapiro speak on campus, accepting claims of leftists that his opinions made them feel “unsafe.” Fun fact: of the ten colleges rated worst for free speech by the Foundation for Individual Rights in Education, three claim to be Catholic, and two are run by the same religious order, the Jesuits. The funeral was grueling: It happened when administrators at U.C. Berkeley allowed a mob of masked “antifa” thugs armed with iron rods to prevent a speech by flippant controversialist Milo Yiannopoulos in January. But free speech’s body was dropped in an open, unmarked grave just last week, when distinguished social scientist Charles Murray was prevented from speaking to students at Middlebury College by a violent mob, which shouted down his speech, then trapped and menaced Dr. Murray in his car as he tried to leave, and hospitalized a professor with injuries. (Read Dr. Murray’s gracious, flummoxed account of this incident here.) So far, administrators have refused to punish the students and other activists involved. If they allow these thugs to go unpunished, they will drop the last few handfuls of dirt on top of free speech’s corpse. I have been sitting at free speech’s deathwatch for most of my life. At 18, I learned from editors of the Yale Daily News that my arguments against abortion and gay activism could not be published because they were “offensive.” When I answered that I was equally offended by much of what I heard in class, but I didn’t try to shout it down, the editor just shrugged. My pieces didn’t appear. While earning my Ph.D. in English lit at Louisiana State University, I saw younger faculty answer a more conservative colleague’s reasoned complaints about the aggressively feminist curriculum being imposed on the English department with the threat of a personal lawsuit, on the grounds that criticizing feminism was a form of sexual harassment. Eventually that conservative professor, worn down by shunning, gave up tenure and went to live in an ashram in India. I saw an English professor give a student a zero (not an F, but a ZERO) on a final seminar paper because she chose to use Thomas Aquinas as a source for literary theory. It caused her to drop out of grad school. For ten years, I edited the guide to U.S. education Choosing the Right College, which tracked the academic quality, campus life, and level of free expression at more than 100 American colleges. The job got more and more depressing over the years, as one school after another junked its curriculum, homogenized its faculty, and tightened the screws on political and even academic speech. The only way you get to the truth is by arguing about it, and listening honestly to those with different theories about it. This was the whole idea behind what we always called a “liberal” education, whose opposite wasn’t a conservative but a “servile” education — a formation that “served” the narrow purpose of preparing someone for a job. In ancient Greece, only aristocrats got an education for freedom, while slaves were taught how to work. It was one of the great achievements of modern America that we offered a free man’s education to everyman — including the kids and grandkids of immigrants, blue collar workers, and the descendants of literal slaves. This sort of abuse is not the exception. It is the rule. Apart from a handful of honorable exceptions, colleges no longer teach the liberal arts or social sciences as means to open students’ minds and encourage them to seek objective truth. 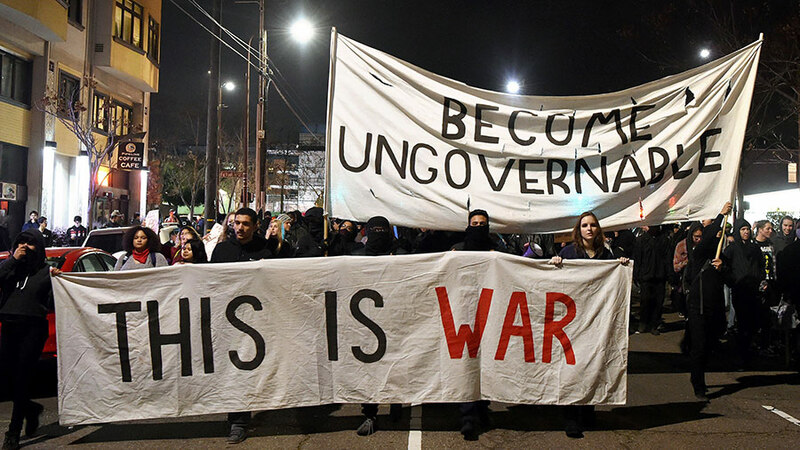 Instead, a privileged professorial class that has mostly purged itself of dissenters uses its distinct social power to re-educate, intimidate, shame and indoctrinate students whose views are more conservative or religious. Faculty don’t like to admit that they are wielding power and privilege, but that is what we give them, when we let colleges serve as the gatekeepers to gainful employment, and lavish them with public and private money to indulge their extremist projects. We can’t indulge the illusion that the U.S. higher education can be fixed by removing a few bad apples. At this point, there are just a few good apples, hiding in barrels of squishy, rotting mulch. We should pressure administrators to enforce the U.S. Constitution on campus, including the First Amendment. We should support lonely, harassed dissenters wherever we find them. But we can’t indulge the illusion that the U.S. higher education can be fixed by removing a few bad apples. At this point, there are just a few good apples, hiding in obscurity in barrels of squishy, rotting mulch, whose toxic emissions addle the brain. American academia is as beyond repair as the Soviet system was in 1989. Parents need to carefully prepare their students at very young ages to be skeptical, fearless, and cussedly independent. They will need the faith of St. Paul, the charity of William Wilberforce, and the thick skin of H.L. Mencken. Home schooling or carefully vetted religious schools makes sense for K through 12. But apart from a few deeply religious schools that (alas) lack much prestige with future employers, give up on the idea that your kids will go through college with a fair chance to speak their minds and expand them. At best they will fight a dogged, rear-guard battle against bullies with tenure and leftists with arbitrary power to censure and expel. As I wrote in this survival guide for Christians on campus, Christian kids should pretend they’re in ISIS-controlled territory and learn to keep their mouths shut. Their teachers don’t want to hear it. They won’t vote to hire colleagues who disagree with them, and conservative or even moderate scholars have stopped pursuing graduate degrees in the humanities or social sciences as a result. American academia is as beyond repair as the Soviet system was in 1989. As citizens, we need to admit that our universities are likely unfixable, and deny public funding to most universities and colleges, except for the narrow fields where they still do their job: in science, technology, engineering, business, and mathematics. Why use taxpayer money to fund the bloated salaries of tenured radicals, so they can poison Shakespeare, U.S. history, and the Bible for a new generation of students? Soon enough, as Charles Murray has warned, the noxious bubble that is U.S. higher education will burst — the moment, in fact, that employers figure out another way to verify that students are intelligent and sociable, and students figure out that for most of them, college is a waste of time. That collapse can’t happen soon enough. Good article. The expression of ideas is not only discouraged in colleges. It is also sometimes discouraged here on The Stream. Gary, The Stream has a point of view. This author is not condemning a point of view. John Zmirak, would you please address Gary’s important comment. Everyone has a point of view. And I think Zmirak is condemning the point of view of those colleges that limit points of view they disagree with. Unless someone is using profanity, expressing a point of view that differs from that of The Stream should not be censored by The Stream. If they only want people to comment who agree with them, then they should make that clear. A college has a very different function from a journal of opinion. We don’t pretend to do “research,” don’t grant accredited degrees, don’t make a pretense of disinterested objectivity. Totally different. The only colleges that fit your description are religious colleges, which proclaim their viewpoint in their mission statements–as we do. You should be aware that Gary’s comments in another article (Tom Gilson’s piece on Disney’s ‘Gay Moment’) raised the ire of Mr. Gilson and others. I suspect that’s what his rant is all about. Gary, have you ever considered that it’s more how you say things that gets you such negative reactions rather than what you say. You do have the tendency to offend with your manner. Maybe, but I doubt it. I think it is what I say that people don’t like. Gary, I know that I have had at least one conversation with you in the past on how you conduct yourself here. I do see a lot of comments from you and I am not surprised that you are getting people worked up. But the Bible does have plenty to say about how we ought to conduct ourselves as ambassadors for Christ. Being a “Jerk for Jesus” at times only makes people ignore what you have to say, and leaves you ineffective, as well as making it harder for others to be taken seriously as well. Still I can’t make you do anything, but I would hope that you may consider changing your approach. I’m curious when this all started happening. I graduated from a state-run college in 1992, and I don’t remember anything like this on campus. In fact, I’d say that the student body as a whole leaned to the right of center. Harvard University went liberal before the American Revolution in 1776. Cambridge and Concord are the Mecca and Medina of American Liberalism. I felt like a lone wolf in class of 1977, UMASS/BOSTON. I was working on my baccalaureate in the 1970’s at a school with a high reputation for putting out more teachers than any other school between the Mississippi River and the West Coast. My Philosophy of Education classes were designed to teach secular humanism, scientific materialism, pragmatism and values clarification. Thre was only one theist in the entire department. Christianity was nowhere to be found. As a history major, the Dean of my department provided experiences quite similar to the scenarios in “God’s Not Dead” in how he would hound Christian students with ridicule and embarrassment in class. Throughout my education career, private education (working with at-risk students) promoted me for getting results. Public education treated me as an anathema for being outspoken as a conservative and Christian. So it’s been around a while. Almost everyone in academia aspires to be an intellectual. The falsehood that to be an intellectual requires holding to evolution has gripped most of them. Behind evolution is Western pantheism, which claims that God does not exist and that nature itself has creative ability (deity). We need to understand that we are fighting a spiritual war, and that behind our opposition are principalities and powers, the rulers of the darkness of this age, and spiritual hosts of wickedness in the heavenly places (Ephesians 6). John Diane, exactly. And it requires real spiritual fire power to be combat effective in this war. Political ‘correctness’ created this problem. Liberalism is currently in vogue in academia and that can change. It will most likely change violently. But it will change. Not necessarily. As Abraham Lincoln said, “”The philosophy of the school room in one generation will be the philosophy of government in the next.” It isn’t just higher education, but secular progressivism has had control over public education for decades now as well. Every upcoming generation has been properly indoctrinated. It is the shadow reason, but also the main reason against vouchers where more students might escape progressive groupthink. I agree a big problem exists; however, colleges themselves are a big problem. Ridiculous costs to “expand student minds/seek the truth” — a big scam. Teach students what they need to know for a career and forget all the fluff. That would mean students would not have to attend as long, which would cost the colleges money. Don’t forget that making money is one of the primary motivations for operating a college.